Vinci , Philippe Keyaerts, Eurogames/Descartes, 1999. 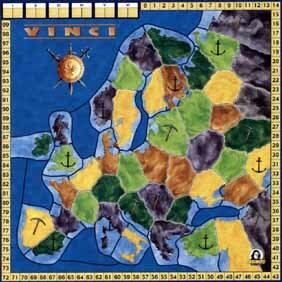 Vinci is an abstract game that has the feel of Parker Brother's Risk , but with much more decision making and no dice. Others have likened it to a simpler, faster version of Civilization , Britannia , or History of the World . 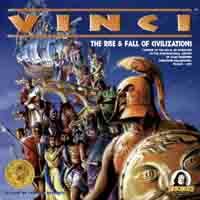 With many web reviews linking Vinci to these classic game, I became intrigued. After 4 playings, I am not dissappointed in the game, and I rank it near my favorite game released in 1999. For your $24 you receive a board, an assortment of counters, 150 wooden disks, a cloth bag for randomizing the counters, and a rules booklet. At the beginning of the game, the civilization attribute counters are placed in the bag, shuffled, and two counters are dealt to each of the 6 civilization spaces on the board. The first intriguing rule of the game is the auctioning of the attribute counters. The first set may be selected for free, but you may choose a set later in the queue for an additional cost: 2 victory points for the 2nd set, 4 victory points for the 3rd set, 6 victory points for the 4th set, etc. After you choose a set, the queue of attributes are marched forward and two more counters are selected and placed at the end of the line. Although the civilizations have no names, the two attribute counters help give it life. Attribute counters come in three flavors: yellow increase your score for holding certain terrain (Mining, Ports, etc. ), red increase your capability to inflict pain and bloodshed on other civilizations (Field General, Conscription, etc. ), and blue break one or other miscellaneous rule (Astronomy allows you to navigate and attack across a sea, Medicine allows you to cure and form another army each turn.) The game is delightful in all the different combinations of attributes that create variety and dictate the way you play your civilization. Perhaps you civilization has Barbarianism and Slavery. That gives your civilization an entirely different feel than if it has Agriculture and Livestock herding. Two red counters usually mean a very aggressive civilzation. Two yellow counters usually mean a more passive one. I hope that players dream up more counters for an inexpensive expansion pack for this game. The only attribute counter I am not too keen on is the Specialization counter, which doubles the value of the other counter. I feel this focuses your civilization too much on one goal. For instance, a Mining and a Specialization attribute counter creates a civilization that scores 2 victory points for each mine region held. This civilization can occupy a much more compact area to score points versus another one that must spread out more and be more vulnerable to attack. The auction rule dovetails nicely with the random production of civilizations. Although you may be lucky and get exactly the right civilization for free in the first slot, more than likely a strong civilization will be deeper in the queue, allowing more than one player a chance to buy it in advance. Those who really want a new set of counters will pay dearly for it because the 6th civilization slot costs 12 victory points. In a 100 point game, this 12 point expense is nearly impossible to regain. Combat in this game is simple, straightforward, and diceless. When you select a civilization, a red number on the the two counters tell how many armies you get, never to increase for the remainder of the game (Medicine is an exception). Conquering a region requires a minimum of two armies, plus one for each defender in that region, plus any terrain modifiers, plus any special civilization modifiers. Conquer as many regions as you wish. Combat is fun. You simply grab all your free armies and march them as far as you can. After you are done battling, you are allowed to reorganize your civilization by redistributing armies into other regions. At the end of your turn, you advance your marker on the score track. Basically you score one victory point for each region, but the yellow attribute counters generally give you bonuses for certain regions. The Slavery counter gives you one victory point for every enemy army you vanquish. Perhaps the most important rule of this game involves putting your civilization in decline. Recall that, other than Medicine, no civilization increases its army count. From the beginning, your civilization has no where to go but down. Eventually you reach a point where you cannot conquer territory the way you once did. At that point you put the civilization to rest and begin a new one. The declining civilization is marked with "decline" counters. You still score victory points with the older civilzation, but since it may no longer move, it rapidly becomes fodder for newer, greater civilizations. Timing is critical because putting a civilization in decline costs one turn (except if you have the Rebirth attribute), which will likely drop you into last place. Several negative points to the game include the sequential turn order and the slightly disheveled rules. Because players take their turns in order, you have a bit of downtime between your last move and your next. For me this is no big issue, I usually enjoy watching the other players sweep across the board like the plague that they are. The rules have a few contradictions and problems, but the two erratta pages mentioned at the beginning of this review should help clear up the ambiguities. Also a few of the rules seem a bit too powerful, such as having two Medicine attributes or using the specialization counters. Other reviewers also cite the importance of turn order saying that the first player has a bit of an advantage. This is corrected by having players bid victory points to see who goes first. Perhaps a second edition of the game will clear up these problems. In the end, our group has found this to be a very enjoyable game, a bridge between the abstract European games and the more in-depth war games. The six player games have clocked in at about 2 hours apiece, but after the first turn everyone pretty much knows what to do and following turns are doing more of the same. The game has a great ebb and flow as new civilizations displace older one. What once was a mighty nation is now fodder for others. And finally, putting your favorite civilization into decline is always an excrutiating decision. It all adds up to a highly recommended game. [an error occurred while processing this directive] Last modified: Thursday, 09-Jun-2011 12:37:14 MST.